Indeed, nearly four-in-ten of the world’s Orthodox Christians live in a single country – Russia. During the Soviet era, millions of Russian Orthodox Christians moved to other parts of the Soviet Union, including Kazakhstan, Ukraine and the Baltic States, and many remain there today. Ukraine has both a substantial Russian Orthodox population and many members of its own self-governing Ukrainian Orthodox Church, with an estimated 35 million Orthodox Christians in total. Ethiopia has a similarly large Orthodox population (36 million); its Orthodox Tewahedo Church claims lineage back to Christianity’s earliest centuries. Due to rapid population growth, Africa also has experienced a more recent increase in both the number and share of Orthodox Christians. In sub-Saharan Africa, the Orthodox population has risen more than tenfold over the last century, from an estimated 3.5 million in 1910 to 40 million in 2010. Sub-Saharan Africa, including a substantial Orthodox population in Eritrea as well as Ethiopia, now accounts for 15% of the Orthodox Christian population worldwide, up from 3% in 1910. Meanwhile, there also are substantial populations of Orthodox Christians in the Middle East-North Africa region, mostly in Egypt (an estimated 4 million in 2010), with smaller numbers in Lebanon, Syria and Israel. Central and Eastern Europe remains the main base for Orthodox Christians, and is home to more than three-quarters (76%) of them. An additional 15% live in sub-Saharan Africa, 4% live in the Asia-Pacific region, 2% live in the Middle East and North Africa, and about 1% live in Western Europe. Nearly 1% live in North America, while even fewer live in Latin America. This geographic distribution distinguishes Orthodox populations from the other major Christian groups, which are far more evenly distributed around the world. Still, the share of Orthodox Christians living outside Central and Eastern Europe has increased somewhat, to 23% in 2010 from 9% a century ago. 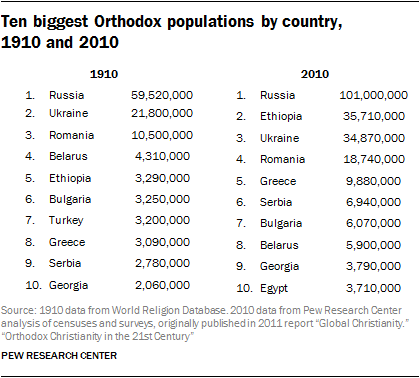 In 1910, only 11 million Orthodox Christians – out of a global Orthodox population of 124 million – were living outside the region. Now, there are 60 million Orthodox Christians living outside Central and Eastern Europe, out of a global Orthodox population of 260 million. While the current share of Orthodox Christians living in Europe overall (77%) does represent a decline since 1910, when 91% of Orthodox Christians were living there, the share of the total Christian population living in Europe has decreased much more sharply, from 66% in 1910 to 26% in 2010. Indeed, nearly half (48%) of the broader Christian population now lives in Latin America and Africa, up from 14% in 1910. One non-European part of the world that has experienced significant Orthodox population growth is sub-Saharan Africa, where the 15% share of the global Orthodox population is up from 3% in 1910. Most of the 40 million Orthodox Christians in this region live in Ethiopia (36 million) or Eritrea (3 million). At the same time, Orthodox Christians remain a small minority of sub-Saharan Africa’s Christians, most of whom are Catholics or Protestants. Results from a Pew Research Center survey conducted in 2015 suggest that the end of communism played a role in the rise of religion in this part of the world; more than half (53%) of Russians who say they were raised without religion but are now Orthodox cite an increasing societal acceptance as a major reason for their shift. The second-largest Orthodox population in the world is found in Ethiopia, where Orthodox numbers have risen tenfold since the early 20th century, from 3.3 million in 1910 to 36 million in 2010. The overall population of Ethiopia has risen nearly tenfold during that timespan, from 9 million in 1910 to 83 million in 2010. 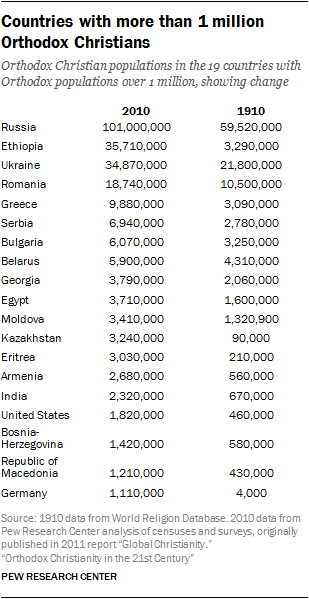 Ukraine’s Orthodox population (35 million) is nearly as big as Ethiopia’s. In all, 19 countries have Orthodox populations of 1 million or more. Of the 10 countries with the largest Orthodox populations in 2010, eight are located in Central and Eastern Europe. In the two separate years for which data are available – 1910 and 2010 – the countries with the 10 largest Orthodox populations have remained mostly the same, with populations of the same nine countries ranking in the top 10 both times. Two additional countries each made the list once: Turkey in 1910 and Egypt in 2010. Over the last century, several sizable diaspora communities of Orthodox Christians have developed in the Americas and Western Europe, areas that, a century ago, had only small Orthodox populations. There are seven countries in Western Europe that had fewer than 10,000 Orthodox Christians in 1910 but now have Orthodox populations over 100,000. The largest of these are Germany, which had just a few thousand Orthodox Christians in 1910 and now has 1.1 million, and Spain, which had no Orthodox community to speak of in 1910 and now has 900,000 Orthodox Christians. In the Americas, there are three countries with over 100,000 Orthodox Christians that had fewer than 20,000 a century ago: Canada, Mexico and Brazil. 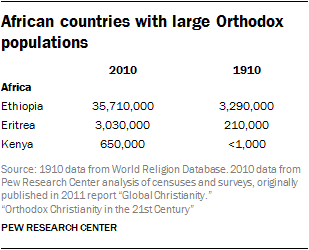 The United States, which has 1.8 million Orthodox Christians, already had 460,000 in 1910. The presence of Orthodox Christians within the present boundaries of the United States dates to 1794, when a small group of Russian missionaries arrived in Kodiak, Alaska, to proselytize its inhabitants. This missionary work continued during the 1800s, but the bulk of Orthodoxy’s growth in the United States owes to late 19th- and early 20th-century immigration from countries across Central and Eastern Europe.11 By 1910 nearly half a million Orthodox Christians lived in the United States, and in 2010 the figure was approximately 1.8 million – about half of 1% of the U.S. population. In all, nearly two-thirds (64%) of U.S. Orthodox Christians are either immigrants (40%) or the children of immigrants (23%), the highest such share of any Christian denomination in the United States.14 Other than the U.S., some of the most common birthplaces for U.S. Orthodox Christians are Russia (5% of the total U.S. Orthodox population), Ethiopia (4%), Romania (4%) and Greece (3%).